In some ways, writing a novel is not that dissimilar to writing a short story – you sit there, write it until it’s done, then edit it until it’s good. But the increased scope of a novel offers some challenges to the editing process that even experienced short fiction authors can find troublesome. Proofreading and copyediting is pretty much the same, but in a long document, it’s harder to catch all of these. The eye sees what it expects to see. A spellchecker is a good start, but most won’t catch form for from or they’re/their/there problems. However, the spellchecker in Google Docs now offers some contextual corrections for errors like these. Regardless, you’ll need to go over the text several times, and I strongly recommend at least one other set of eyes just for proofreading. You’ll need more than just technical editing, though. Novels are complex beasts and plot and characterization issues become exponentially more involved with length. Novels allow you to explore stories and characters with greater scope and depth than a short story, which can be a joy. But that latitude also gives authors enough rope to hang themselves — people behaving out of character, sub-plots taking over or disappearing, even the main plot derailing. It can be impossible to hold all the events of your story in your mind as you write, so the editing process becomes essential for working out all these tangled threads. I’ve learned that there are a few tricks that, when employed during the initial writing phase, really smooth the editing process. I didn’t know where my weaknesses were until I’d written a few novels Editing my first novel was more of a nightmare than it had to be because I just wrote it as it came then had to go over everything from scratch. I had nothing other than the text to go by, and after a few passes I just saw what I knew should be there. Years after I “finished” the book, I still found the odd typo or error. After a bit more experience, I learned that there are some easy things you can do while working on your first draft to make editing less of a chore. One way to help keep it all together is creating a “story bible”, where all characters, plots and other details are listed. Some authors count each time a character appears and where, to help keep track of who is important and who might be trying to usurp a more major role. Outlines can be useful here as well. I don’t tend to outline much before I start the novel, but I now keep a running synopsis of each chapter as I write it. This helps me keep track at a glance of the action and major events. One of the other challenges that the novel’s length presents is what, in cinema, is called continuity. In long fiction, especially with many characters, this can be the most difficult part of editing. Does your character have short, brown hair in chapter 3 then mysteriously have long, blonde hair in chapter 17? Worse yet, is her name Clara in chapter 6 and Claire in chapter 10? These problems happen all the time and can be very difficult to find. Using a story bible or character sheets can help stop them before they start, but the editing process is essential to ensuring the constancy of your settings and characters. From a technical standpoint, using the “replace all” function in your word processing software can be a godsend for situations like these. 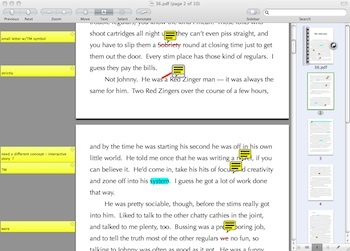 However, if you’re going to let the machine do any automatic changes for you, I highly recommend using a tool with versioning; I like Scrivener for composition but many other writing tools offer simple methods of version control. Even if you’re just using a basic word processor, you can do your own versioning by saving a copy of your draft before making any major changes. I have learned that I have a particular problem with time. A scene can start with the sun going down and end with the sun coming up but it’s been only a few hours around noontime when the action occurs. I’ve taken to including what time and day the scene occurs in my running outline to try and head this off at the pass. It also helps me keep track of the passage of time at a simple glance at the outline, which is very helpful when working on pacing. Not all of these methods will be useful to you; all authors develop their own bags of tricks for keeping their stories in line. And some novels cry out for different techniques than others — an epic historical fantasy might want a complete worldbuilding book while a small cast first contact story may need only a brief outline to make sense of everything. Knowing that the devil is in the details before you start writing is the most important part of preparing for editing. Editing my first novels would have been much simpler processes had I known this then and every time I come to edit a novel now I find myself grateful to my past self for making those notes about character, setting and time that I refer to over and over again when editing.